Map showing the area where the Okeanos Explorer will conduct operations during the New England Seamount Chain Exploration. Image courtesy of GEBCO, the U.S. Extended Continental Shelf Project, and NOAA Office of Ocean Exploration and Research. Download larger version (jpg, 2.5 MB). NOAA Ship Okeanos Explorer will conduct seafloor and water column mapping operations in the Western North Atlantic Ocean over a portion of the New England Seamount Chain from June 11-29, 2013. Seafloor bathymetry and acoustic backscatter data as well as water column acoustic backscatter data will be collected continuously. Sub-bottom stratigraphic data will be collected daily between the hours of 1000 and 1800 for the duration of the expedition. Okeanos Explorer will be sailing from and returning to its home port of Davisville, Rhode Island. The New England Seamounts are a chain of extinct submarine volcanoes that extend from east to west across the North Atlantic Ocean. The chain was created by the movement of crustal plates across a relatively stationary “hot spot” plume of magma, deep in the Earth’s mantle. The youngest and easternmost seamount (Great Meteor) formed approximately 80 million years ago and the oldest and westernmost seamount (Bear) formed approximately 100 million years ago. 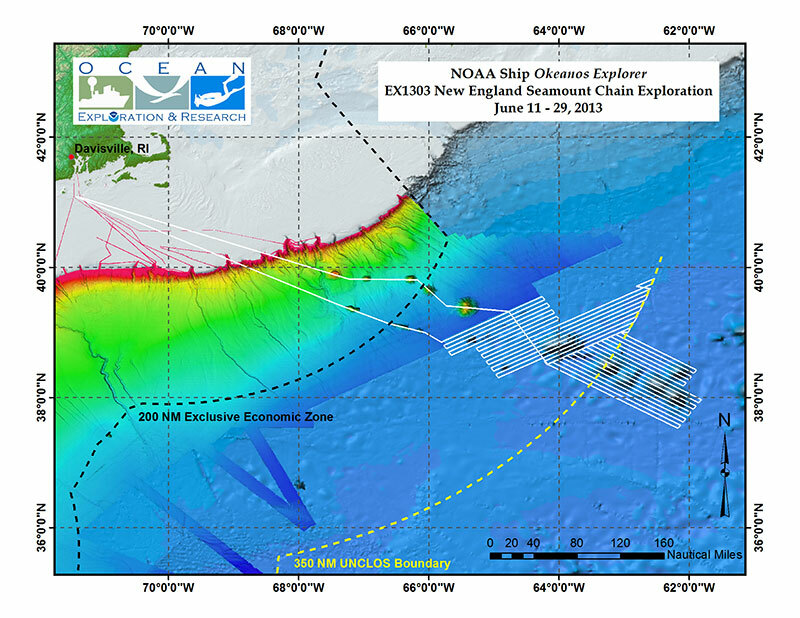 A detailed description of the geology of the New England Seamount Chain is available online. During this expedition, Okeanos Explorer transit and survey mapping operations will collect data over Asterias, Atlantis II, Balanus, Bear, Buell, Gosnold, Kelvin, Kiwi, Mytilus, Physalia, Panulirus, Picket, Retriever, and Sheldrake Seamounts, in accordance with priorities gathered from the scientific community. The New England Seamounts are “islands” of hard rock substrate on an otherwise sediment-covered abyssal plain. They are exposed to upwelling as ocean currents move over and around them. These physical characteristics result in unique and isolated habitats for a wide variety of marine species. Of particular note is the abundance and diversity of deep-sea corals on the seamounts. The New England Seamount Chain Exploration will produce high-resolution maps of the bathymetry and acoustic backscatter, which will contribute to scientists' understanding of the distribution of benthic habitats on the seamounts and will be invaluable for the planning of future exploration and research. The bathymetric and backscatter data collected on this expedition will be used as part of the U.S. Extended Continental Shelf (ECS) Project. The mission of the ECS Project is to establish the full extent of the U.S. continental shelf, consistent with international law. The data collected by the Okeanos Explorer during this exploration will improve our understanding of the unique geology and biology of the New England Seamount Chain as well as contribute to national continental shelf mapping priorities.